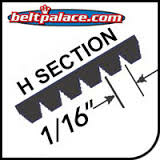 Home > Heavy Duty V Belts > Poly-V Ribbed (Micro -V) Belts > H, PH Section Belts - 1/16" Rib Width. Industrial Poly V. > 240H4 Poly-V Belt. Metric 4-PH610 Motor Belt. 240H-4 Poly-V rib belt. Neoprene/Black Rubber. CLEARANCE PRICED WHILE SUPPLIES LAST* 4 Ribs. 24.0” (610mm) Length - PH610 Metric belt. X-ceed “H” Series Poly-V ribbed belts are designed to replace OEM belts on extra heavy-duty applications such as 240H4 massage chair belts, small mechanical component belts, 240H4 (4-Rib PH610) home appliance drive belts, and electric power tool drive belts. 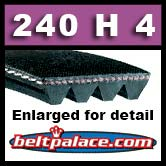 AKA: H4-240 Belt. NOW IN STOCK! ORDER NOW AS AVAILABILITY IS LIMITED! Hitachi Bread Maker Belt for HITACHI HB-B201, HB-B101/B102/sB301 HA32147001, 3214-701-0001 belt. *Please check old belt prior to purchase, some models switched to a "gear" belt in later production runs (we have those, too). Belt labeled "240H" or "PH610" with 4 ribs (3 grooves). Import Belt RB/PH610 (4 Rib), Rippenbander PH610/4. Metric Poly V: 4-PH610 (4/PH610).